This soup is absolutely delicious! Think, tomato bisque soup with a twist. Healthy, hearty, and great leftovers. Heat oil in a skillet over medium heat. Sauté the onion with a dash of salt until translucent, about 5 minutes. Add the potatoes and another dash of salt, and sauté until just translucent around the edges. Stir in the curry, brown sugar, ginger, garlic, and chili and cook until fragrant (mix spices beforehand), about 30 seconds. Pour in 1/4 cup of broth and scrape the bottom of the pan to deglaze. Pour this onion-potato mixture into the bowl of your slow cooker. 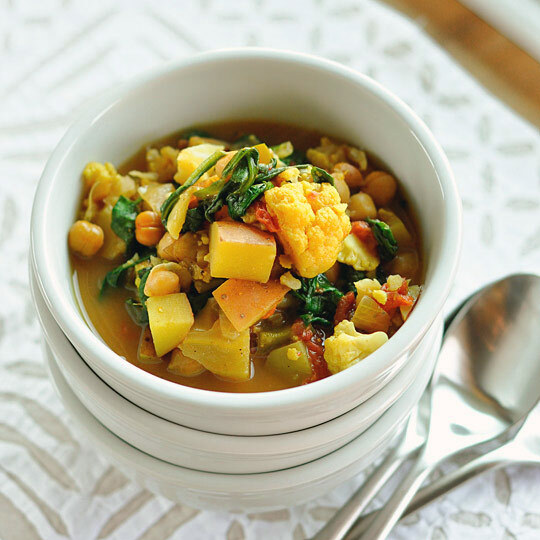 To the slow-cooker, add the rest of the broth, chickpeas, bell pepper, cauliflower, tomatoes with their juices, the pepper, and the final dash of salt. Stir to combine. The liquid should come half-way up the sides of the bowl; add more broth as necessary. Cover and cook for 4+ hours on HIGH. Stir in the spinach and coconut milk. Cover with lid for 1 minute to allow the spinach to wilt. Taste and adjust as needed. I don’t think I’ve ever had a curry soup before… this is quite interesting and looks very yums!